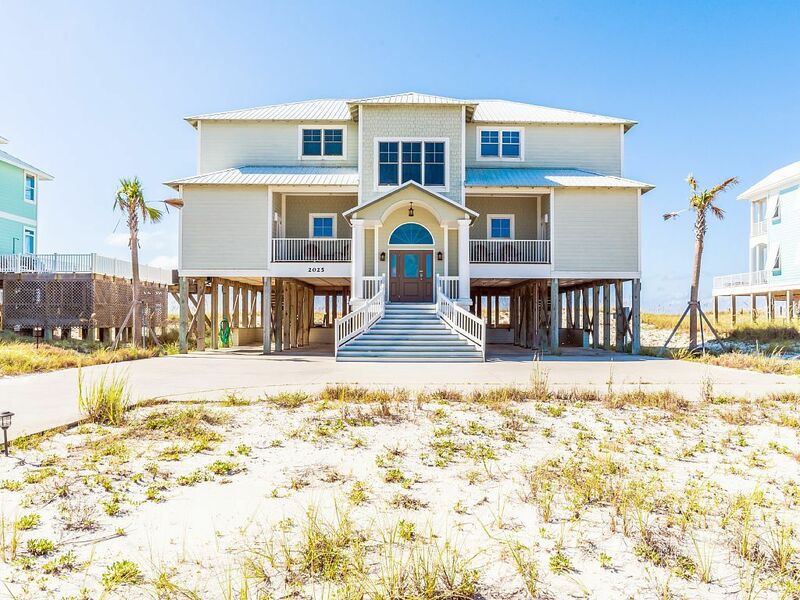 “Crews Quarters” is a newer gulf front six bedroom, six and one half bath home and is not only spacious, but all six bedrooms offer a view of the Gulf of Mexico. Located approximately 3.8 miles west of Hwy. 59 on West Beach in Gulf Shores AL. “Crews Quarters” is multi-level with a large open deck perfect for relaxing and listening to nothing but the sound of the waves. A concrete driveway leads to plenty of parking and the ground level entrance of the home. The brand new dune walk over enhanced with a convenient outside shower make going to and from the beach easier. The main or first level of “Crew’s Quarters” features a spacious living area featuring a 60 inch SMART TV, enhanced with high ceilings and windows that bring the sunshine in to an already sunny yellow room. Open the door from here to the outside deck and for those who can’t wait to put their toes in the sand there are steps leading to the crystal white sand below. Incorporated into the living area is the dining area and fully equipped kitchen with modern appliances and bar seating. The kitchen features two dishwashers and a full sized fridge, we have recently added a second fridge by the wet bar on the main floor. The wet bar with a sink and ice machine is located on the northeast side of this area along with a convenient half bath. The first floor has 2 bedrooms, that are located on the east and west side of the home; each has a king bed and private full bath with Jacuzzi tub, separate shower, and double vanity. Heading upstairs to the second level is a roomy common area that includes two corner “nooks” that can be used for game playing, reading, and additional sleeping. A full size laundry facility is also on the west end of this space. The west and east bedrooms each have a king bed and private full baths. In addition, each of these two bedrooms have private gulf front balconies, perfect for afternoon reading. The guest bedrooms are located in the middle on this level and have two sets of bunk beds in one room and a full over a full bunk-bed with a pull out twin trundle under the bed in the other. Both of these rooms also have private bathrooms. ALL the bedrooms face the gulf and have DIRECT GULF FRONT VIEWS!! This home is also built on a LARGE 100 FT WIDE GULF FRONT LOT, so you have ample room to spread out on the beach. This home has 4 master bedrooms, the 2 on main floor have large bathrooms with jetted tubs and the two upstairs have amazing COVERED PRIVATE BALCONIES overlooking the GULF! We are a smaller family owned vacation rental company, and we reside locally in Gulf Shores, AL. We would love to host your family and friends for your next BEACH VACATION on our beautiful gulf coast! Great gulf front home with huge gulf side private deck around the private pool. "Crews Quarters" is a newer direct gulf front home located in Gulf Shores AL.This home has 7 bedrooms & 6.5 baths and has a large gulf side deck with private pool overlooking the Gulf of Mexico. Sleeps up to 20. Perfect location & soo roomy! We had a wonderful with our family! The house was very comfortable & the pool on the deck was a hit with the grandkids. The weather could have been better but the house was great! This beautiful house is all it claims to be and more. It is spacious and nicely furnished with fabulous views of the beach from every room of the house. The layout of the house was perfect for our family. Each set of grandparents had their own suite and deck area on the main level, and the upstairs offered a sitting area and ample bedrooms and bathrooms for a young family with three children. The two upstairs king suites had great views from their balconies. We all had space to call our own, but most of the time was spent in the great room eating, playing games, and visiting. The weather was not altogether cooperative, so we appreciated all the more having a nice house with beautiful views. We prepared meals in the well-equipped kitchen. The beach access is perfect, and though we did not use the pool, what a treat it would be with the right temperatures. The owner/manager was pleasant to work with and always quick to respond to any questions. It has covered parking for four vehicles. I rely heavily on reviews when I choose a property, so I would suggest anyone choosing this property because it has an elevator should clear that with the owner since there was a "do not use" sign on it when we arrived. Since it was not an issue for us, I did not pursue it. The stairs from the ground level are steep both in front and back. I recommend this property without reservation. I will certainly use it again if/when we are fortunate enough to be in the area. Had an amazing week of R & R with family! We loved staying at Crews Quarters, a wonderful beach house in Gulf Shores. The house was perfect for us and very well equipped and comfortable. The bedroom situation provided everyone with nice beds, plenty of privacy and room for everything. Our grandkids utilized the table upstairs for some marathon Monopoly games. We loved having the pool right outside the back door, and especially enjoyed the great view of the beach that we had from the deck. It was easy to enjoy the view and watch kids in the pool at the same time. We had such a good time and would love to return next summer if the house is available. WHAT A GREAT HOUSE & BEACH ACCESS! The house and all of its amenities were great. We had 4 generations staying there and it met all of our needs. We would all definitely recommend this house and experienced no problems while we were there. The beach access was wonderful and the pool just adds to it. There are lots of good restaurants in the area and a lot to do within an easy drive. We drove to Dauphin Island one day to the aquarium and then stopped at the Military Park in Mobile to see the ships and planes. We spent one morning at Alligator Alley. We drove to Pensicola to the air force base and watched the Blue Angels practice. Then toured the free museum there and even ate lunch at the café in the museum. It was a great day. We went to the Wharf at Orange Beach . We checked out the shops and watched them weigh in a Marlin during a fishing competition. It weighed 740.6 lbs., was 118" long and was caught by a woman. Then we enjoyed a really great dinner at the Jenny Lane restaurant there. Plenty of time was spent enjoying the beach, the pool and even watching the dolphins play. So worth every penny !!! I have to admit renting something without seeing is scary but the Crew Quarters home was AMAZING.. I had all my kids and grandkids 13 total and we still had plenty room. It was quiet and relaxing and fully equipped with everything we could need. The upstairs was so nice with the game room for the kids to hang out and play board games which were supplied by the owners. The Beds were so comfy the owners definitely do NOT go cheap those beds were so cozy. We decided to stay an extra night and the owner Greg who is awesome emailed me back within 30 minutes to approve it. No waiting around wondering. Greg was there anytime I had a question before during and after our trip he is very professional.. Thank you Greg and see your home again soon ! !